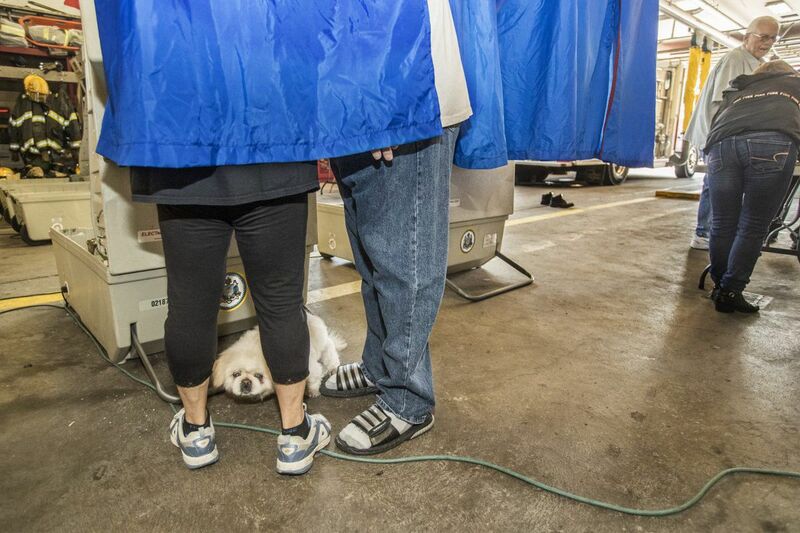 Tio, the Pekingese puppy, situates himself between Elivira Pruiti, left and John Pruiti, as his masters vote at Engine 49 at 13th and Shunk in South Philadelphia on May 15, 2018. If I hadn't run for committee person in my little slice of Queen Village – Ward 2 / Division 15 – I may never have known why my neighbor votes every Election Day. His mother didn't have the right to vote in her native Mexico until the age of 36. She made sure he and his siblings all registered to vote on their 18th birthdays — and they don't take the privilege lightly. I've lived in Queen Village for 10 years, but I'd never talked to my neighbors about politics. Not until I decided more than a year ago to run for Democratic committee person. Between February, when I set out to collect signatures for my petition to get on the ballot, and Primary Day it's safe to say I talked to hundreds of my neighbors about politics. The experience of campaigning was humbling, and I'm grateful to have been elected a committee person at a moment that feels like a turning point. In our ward, only five of 49 committee people elected were incumbents. Across the 2nd Ward, turnout was up 42 percent from 2014, and it seems to be mostly due to canvassing by committee-person candidates motivated by a desire for change. Yet, that excitement is dampened by Philadelphia's low overall voter turnout. Seventeen percent … only one out of six people voted – how can that be? I hear the usual post-election laments, and I share that disappointment, but what happened in my division and ward makes me hopeful. I believe the crop of new, motivated committee people in our ward and citywide can do a great deal to increase voter turnout in upcoming elections. Committee person is the most hyperlocal office in the Democratic Party. When I was knocking on doors these last four months, I explained it to people as a "political block captain." I didn't know committee people existed until early 2017, when I attended a workshop run by the Coalition of Labor Union Women and Philadelphia United for Progress about running for local positions. I was surprised to learn my division had two committee people, since no one had ever knocked on my door. I decided that night to run. What I didn't realize was that running for committee person in itself would get people engaged. Canvassing before the 2017 primary led to a few new voter registrations plus a neighbor deciding to run a write-in campaign for a Board of Elections role in our division – and winning. And with all the activity in our division this past election cycle – we had a competitive race with six candidates vying for two seats – voter turnout for our division's committee person election more than tripled. The City Commissioner's office doesn't offer data on turnout by division, but looking at the number of votes cast for committee person in 2014, when the top vote-getter received 66 votes, I can estimate turnout for that race to be 9 percent or lower. In 2018, it was 32 perecent. In 2018, 230 people voted for committee person – just over double the number of our division's "super voters," or those who cast ballots in the last four elections. That means my fellow candidates and I got more than 100 people out to vote who don't usually vote in primary elections. I believe this affected the up-ballot races. An unopposed Tom Wolf got 223 votes in our division in 2018. In his 2014 primary, he lost in our division to Alyson Schwartz, 54 to 60 – and the total vote count for that contested governor's primary was a measly 131. What all this tells me is that the magic of one-on-one voter interaction is real – politics starts with your neighbors. If you're depressed by this election's voter turnout, dive into the next election cycle. It's already here. Canvas for a candidate or an issue you believe in – and if you only have an hour or two, do it the weekend before the election in your own neighborhood. Talk to familiar faces about why voting matters to you and to them. Get your kids involved – kids love knocking on doors, and most people love opening their doors to kids. And if you need some guidance, you know where to turn: Ask your committee person. Caroline Tiger is a marketing professional who lives in Queen Village with her husband and two children. She was elected Democratic committee person for Ward 2 / Division 15.